Are Development Dollars in Pakistan Being Well Spent? To development experts who have long called for a shift in strategy in the Muslim world, it would seem like cause for celebration. After years of devoting the bulk of U.S. aid to Pakistan to military assistance, Washington is about to shift that equation. Under legislation approved by the Senate last week and by the House on Wednesday, Pakistan can expect to receive $1.5 billion of non-military (or civilian) aid for each of the next five years, which triples previous levels and will roughly balance out the amount of military aid the U.S. gives to Pakistan. But getting the money is only half the battle; how well it works  and whether it helps to change strong anti-American sentiment  depends on getting it to the right people and projects on the ground. That job principally falls to the U.S. Agency for International Development (USAID), and many critics say its performance isn't very encouraging. "When you are spending large amounts of money at arm's length, operating in hostile environments, it is very easy for money to get spent corruptly and/or badly, and that is what I have seen in our health programs," says Roger Bates of the American Enterprise Institute, a trenchant USAID critic. One early effort in education already appears to be a cautionary tale. Improving schooling in the country has been a key focus of U.S. development efforts, both to undermine the need for and appeal of religious schools (or madrasahs) and to advance literacy, which is 43% among adults; two-thirds of Pakistani women cannot read or write. In long, jargon-filled reports, the principal USAID contractor on an $83 million, five-year education-sector reform project, North Carolinaheadquartered RTI (also known as Research Triangle Institute), claims to have "positively impacted" more than 400,000 students (out of 70 million school-age kids) through strengthening policy and planning, teacher and school-administrator training, and youth and adult literacy. But when USAID's inspector general sent a team over in August 2007 to check on the progress, it could not validate the claims because the USAID mission in Islamabad "did not require RTI to adhere to reporting requirements critical to monitoring the program performance." The problem was serious enough for RTI, which derived close to 40% of its $710 million in revenues last year from USAID, to be disqualified from follow-on contracts on this particular project. Eighteen months since the IG report, USAID has also not adequately accounted for $16 million in project spending and has hired an outside auditor to track the money, according to Dona Dinkler, the USAID IG's chief of staff. USAID declined to comment, but it has blamed high staff turnover  four different USAID employees oversaw the project successively  and security concerns, which severely limited the number of hands-on visits to the remote Sindh and Baluchistan provinces, where the project was meant to have its greatest impact. "In that case, you have to find other ways to provide oversight to the extent necessary to protect American taxpayer dollars," says Dinkler. Unfortunately, similar shortcomings continue to plague the IG's work too; their own auditors never left the capital of Islamabad, also due to security concerns  an institutional blindness that was the focus of some pointed questions during a recent House National Security and Foreign Affairs Subcommittee, chaired by Democratic Representative John Tierney of Massachusetts. For its part, RTI says it is "proud" of what it insists was a successful project. "In retrospect, RTI and USAID could and should have done a better job in promoting its success," said a company statement. "We think in time these successes will be better understood and appreciated." Well-informed Pakistanis say this dismal performance is all too typical. Worse, they insist, it hints at the structural problems that are plaguing America's aid programs. 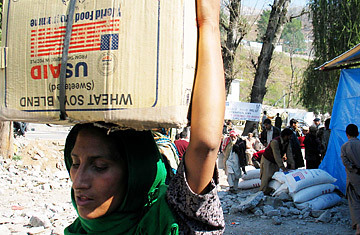 "I don't mean to be unnecessarily harsh on [US] AID, but I have spent the last eight years on the ground there in Pakistan and feel very disillusioned and extremely bitter that when American taxpayers and the public thought they were helping, their money was not put to good use. It did not reach the people  I saw it with my own eyes," says Nasim Ashraf, a Pakistani American who directs the Middle East Institute's Pakistan Studies Center in Washington. While living temporarily in Pakistan, Ashraf ran the National Commission for Human Development, a Cabinet-level post charged with raising key educational and health metrics; he gives higher marks to the World Bank's education effort in Punjab and to less well-funded efforts by other donor countries. Part of USAID's problem is a "bunker mentality" that exaggerates genuine security concerns, he says, noting that agency regulations prevented key personnel from accompanying even members of Congress who traveled there to examine aid projects. But other observers say the problems go far beyond security issues. For Shuja Nawaz, a Pakistan security expert and director of the South Asia Center at the Atlantic Council in Washington, the core of USAID's shortcomings is that it has outsourced "its thinking, planning and local interactions with the recipients" to Beltway contractors who are more incentivized to keep money flowing than getting results on the ground. In one case, a firm that was contracted to provide special surgical lights and other advanced technology to hospitals and clinics in the country reportedly failed to take into account the fact that there was no source of electricity to power the new equipment. Nawaz says USAID needs to work directly with local NGOs in identifying and designing projects that local communities will "own" and sustain. That, however, would require far more manpower than USAID currently has; over the years, funding cuts have eviscerated it down to little more than a contract-management agency. USAID officials, who did not make themselves available for this article, told Congress this past summer that they are rapidly staffing up for Afghanistan and Pakistan, where the agency may soon have its biggest footprint since Vietnam. Currently the dependence on highly paid consultants means at least half of every development dollar stays in the U.S. The Obama Administration seems to recognize the problem. "Let's face it, we have devoted a smaller percentage of our government budget to development than almost any other advanced country, and too little of what we have spent has contributed to genuine and lasting progress," said Secretary of State Hilary Clinton in a July 15 speech at the Council on Foreign Relations. "Too much of the money has never reached its intended target but stayed here in America to pay salaries or fund overhead in contracts." Ironically perhaps, one of the best things Clinton can do is to rebuild and finally install new leadership at USAID so it has a better chance of being able to handle all the money that's about to flow to crucial places like Pakistan. Read "How Washington Will Measure Pakistan's Success."